November 6, 2018, is a really important election to many people, and it’s just around the corner. 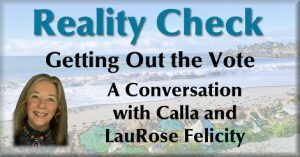 If you are feeling enthusiastic, or maybe concerned about this election, and want to know what you can do to really make a difference, we’re having Calla and LauRose Fellicity from the local Democratic office in to talk about getting out the vote this November. This week on Reality Check on KCIW. The opinions expressed here are those of the individual participants. Curry Coast Community Radio doesn’t endorse any political candidates or take any position on issues discussed in this program.